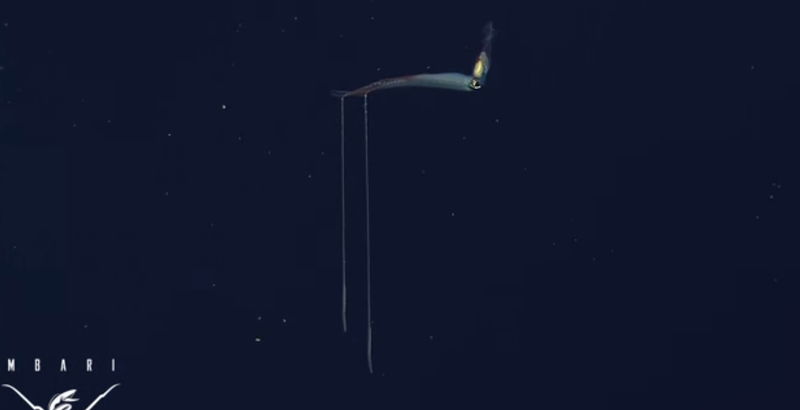 As explained in the video, juvenile C. calyx squids orient and color their tail and body to closely match the appearance of the common mesopelagic siphophore Nanomia. This behavior is not present in later life stages. As they age, they lose the tail and the ability to resemble Nanomia. It is likely that the smaller and more vulnerable juvenile Chiroteuthis avoid predation as a result of mimicking Nanomia’s appearance and behavior and simply hiding in plain sight.